Tamarind (or sampalok in the Filipino language) is the name of the fruit of the Tamarindus indica and the name of the tree itself. According to the California Rare Fruit Growers website, the tamarind is native to Africa but introduced to India a long time ago. It is an important ingredient in East Asian and Southeast Asian cooking. The fruit is used as the base for soups, stews and sauces in many Southeast Asian dishes. You will find tamarind listed among the ingredients of dishes from the Philippines, Thailand, Vietnam and other parts of the region. Because of the natural acidity of its fruit and leaves, in Philippine cuisine, the sampalok — both fruits and leaves are used in cooking — is used for flavoring soups (like sinigang) and stews (like dinuguan). But, ironically, the fruit of the sampalok is also used for making candies. The shelled, boiled fruits, when rolled in sugar, is a very popular Philippine delicacy. Unlike citrus that need only to be cut and squeezed, the traditional way of extracting the juice from the tamarind is to boil it in water and to mash the fruits to squeeze the pulp. It does entail work so a lot of people opt for the more convenient tamarind paste in jars or the powdered soup base for cooking sinigang. I used to but not anymore. I extract the juice from about hundred grams of fresh tamarind today to cook a pot of chicken sinigang, for instance. The first thing to do is to rinse the tamarind to make sure that it is clean before it goes into the pan. Place the washed tamarind in a pan and cover with water. Boil until the skins burst and the pulp is mushy, about 20 minutes. Transfer to a large bowl with half of the cooking liquid. Mash the tamarind with a fork. If you have a vegetable masher, it will make the job easier. Place a strainer over a bowl. Dump the mashed tamarind into the strainer and allow the juice to drip into the bowl. With the strainer with the tamarind in it still over the bowl with the juice, pour in the rest of the cooking liquid. With the tamarind submerged in liquid, mash once more, forcing as much of the pulp through the strainer. Strain once more. And you have your tamarind juice. This is an updated post; the original was published in November 18, 2008. I remember ganyan ginagawa ng Nanay ko dati nung bata pa ako pag nagluluto siya ng sinigang. Those were the days when sinigang extracts were not in the market yet. 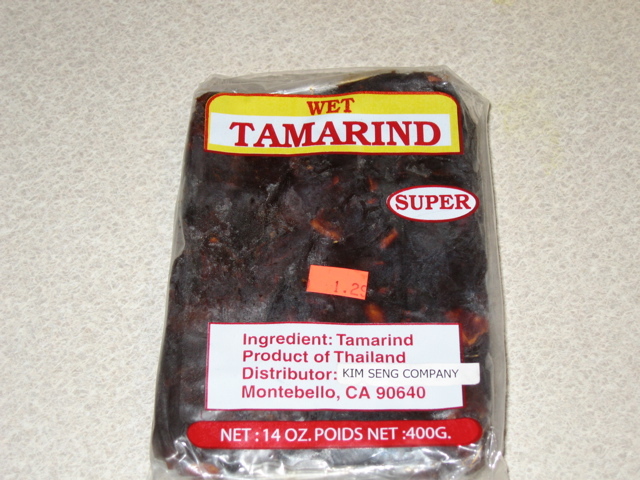 I would imagine that powdered tamarind doesn’t have quite the same taste, do you find the same for tamarind in a jar? I use blocks of mashed tamarind (like this one: http://www.blazinghotwok.com/images/tamarindblock.jpg), it still needs to be soaked and strained. I’m using tamarind in a jar currently since it’s a lot less work and I don’t really taste any difference. Then again, I don’t usually use tamarind as a base for most of the stuff I cook, just as last-minute flavour. Cherleen, you know, the texture is different when you use fresh tamarind juice especially in sinigang. And there is something about the seemingly mindless mashing and straining that is soooo relaxing. Rose, the tamarind paste in jars are okay but they’re rather expensive here. My kids like their sinigang really sour and to achieve that, I use half of the contents of the jar. Haven’t tried those tamarind blocks yet. Will check if I can find them here. You are always creating such interesting dishes! I learn something new every time I visit your blog. hi mss. connie… i agree with you about cooking as recreation. pagfeeling ko, mababaliw na ako with work or studies, angry/frustrated about something, or plain bored, i would go down to our kitchen and play. be it kneading dough (very relaxing), slicing some fruits for a refreshing salad, the smell of baking cookies or pounding meat with a mallet. Misao, I think the aromas have a lot to do with the relaxing feeling. A natural aromatherapy! make juice out of,like Connie has demonstrated. I remember when the commercial for the sinigang mix came out…”sampaloc ay iyong nilalaga, pinipiga, sinasala..” they made extracting tamarind juice look like tedious work, and the sinigang mix was the answer to our prayers. Im glad you made this…goodbye sinigang mix! Yes, native. The amount depends on whether the tamarind pods are large or small. Sinigang for five people would be around 1 kilo of meat; I’d say anywhere from 1-1/2 to 2 c. of tamarind would yield enough juice for a tasty broth. Thanks Connie!! I’ll definitely try doing it the natural way. My family loves sinigang but we’ve been using powder mixes all this time. I want to buy tamarind juice (retail sale). Do you know where? Tahnk you.